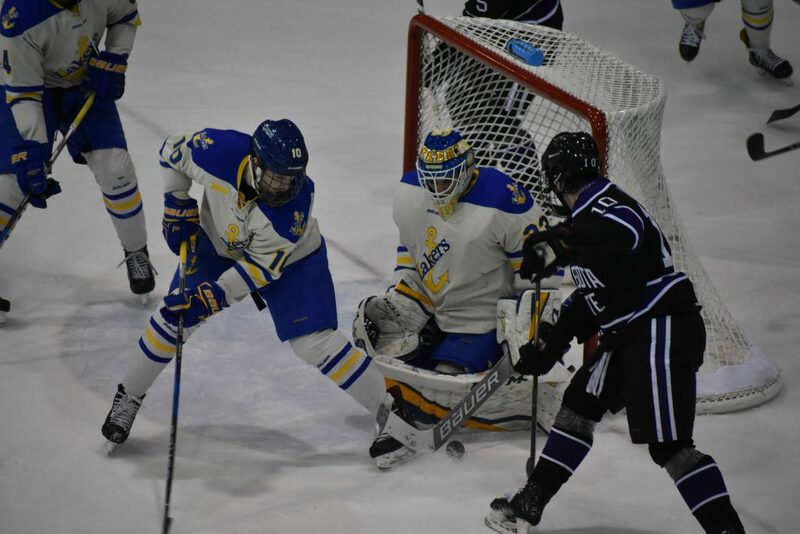 A quick start by Lake Superior State could not be sustained in the first game of the Western Collegiate Hockey Association (WCHA) Semifinals, as the Lakers fell 2-1 to Minnesota State – Mankato on Friday night. With the semifinals being a best of 3 affair, Lake Superior must win on Saturday to keep its season alive in their quest for the league tourney crown. 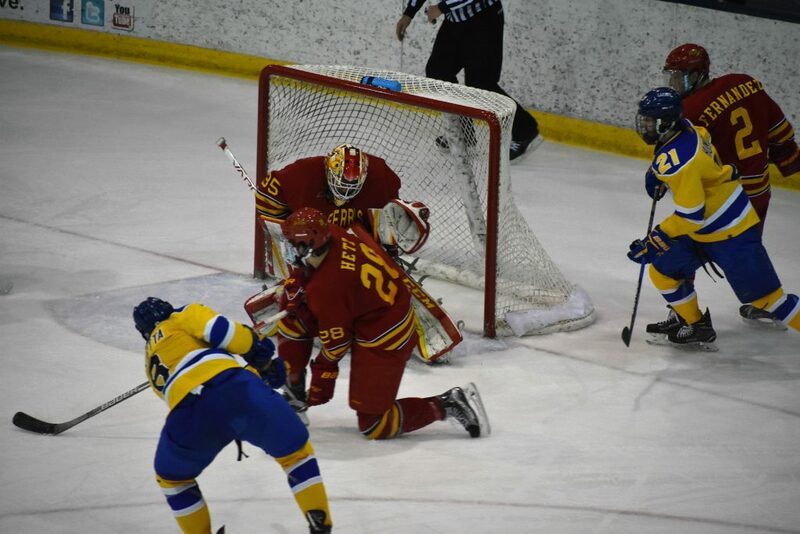 Lake Superior (23-12-2) got on the board first when senior captain Diego Cugletta got in the Maverick zone on a 2 on 1 and fired the puck over the left shoulder of Minnesota State netminder Dryden McKay. For Cuglietta, it was goal number 25 on the season and point number 100 in his collegiate career, as the forward from Kamloops, British Columbia, became the first Laker to reach the century mark since Dominic Monardo did so with a goal in a 3-0 win over Northern Michigan in 2013. Two goals by the Mavericks (30-7-2) later that period quickly turned the Laker lead into a deficit. Charlie Gerard scored his eleventh goal of the year on a breakaway that beat Laker goalie Nick Kossoff on the glove side at 6:18 of the first. 1:02 later, Walker Duehr made it 2-1 Mankato by collecting a pass from behind the net and firing it point-blank at the net, giving Kossoff little chance. With the Mavericks styming the Lakers at nearly every turn, a comeback just wasn’t in the cards for the visitors. The Lakers were 0 for 5 with the man advantage and had a remarkably difficult time setting anything up on their chances. Even pulling Kossoff for an extra attacker proved difficult, as Lake Superior could not maintain zone possession long enough to get their netminder pulled. Early in the third, Minnesota State briefly appeard to go up 3-1, as Gerard put the puck in the net while being taken down by Laker defenseman Steven Ruggiero. A review disallowed the goal, but permitted a penalty shot, which Kossoff deflected up high and away. In net, Kossoff made 29 saves on 31 shots, while McKay stopped 20 of 21 to collect the win. Since New Year’s, the Mavericks have allowed just 25 goals in 19 games. Of the 19 games, they have allowed more than 2 just once, a 5-3 win against Lake Superior. Lake Superior will look to extend their season tonight, as they aim to hand the Mavericks just their second loss on home ice all season (a 1-0 win by the Lakers on January 19th was the first). Game time is at 8:07 p.m. EST. There are a lot of people online talking about how the Minnesota State-Mankato Mavericks could very well go on to win the whole NCAA tournament. Being behind only St. Cloud State in the USCHO poll & #3 behind St. Cloud State and UMass in the Pairwise this is to be expected. After seeing how they played this year, the point would be hard to argue. Against the upstart Lake State team, the Purple Bulls are 3-1…but remember, that 1 loss was at the Verizon Wireless Center. The junior trio of forwards Marc Michaelis, Parker Tuomie and Charlie Gerard lead the Mavs in scoring. Michaelis leads the pack with 19-20-39, Turomie with 14-23-37 and Gerard has 10-17-27 total points. Dallas Gerads has the third most goals with 12, and 21 total points. Dryden McKay is the outstanding freshman goaltender for Minnesota State. He has played in 30 of their 38 games and has posted a 21-6-2 record. Outgoing senior Mathias Israelsson has played in 10 games, with an 8-1-0 record. McKay has posted a 1.72 GAA and a .928 Save%. There doesn’t seem to be many holes in their armor, so the Lakers will be in for a tough one. It has been a long time since the Lakers have won a playoff series, let alone one at home. But with a pair of 3-1 wins against the Bemidji State Beavers, the Lakers travel once again to Mankato, the site of many losses for the Lakers. But again, the Lakers beat them in their own arena once this year, and forced a game three against them in a previous playoff series. Diego Cuglietta still leads the team with 24 goals, 16t assists for 40 total points on the season. He remains only a single point off of the century mark, and is one goal ahead of ASU’s Johnny Walker and NMU’s Troy Loggins for the most goals in NCAA D1 hockey. Following behind him still are fellow senior Anthony Nellis (15-18-33) and junior Max Humitz (16-16-32). Humitz is poised to hit the 100 point mark next season, if he chooses to return. As of right now, going into this series he has 80 points. His lowest point total was last year with 23 points. Unless something radical happens, I believe that for the rest of the WCHA playoffs with feature senior goaltender Nick Kossoff will have the net. Playing in 25 games, he has posted 17 wins, 6 losses and 2 ties alongside a 2.45 GAA and a .917 Save%. If the series goes three games, you may see Mitens. There’s a lot that can happen this weekend. Please refer to the previous post for some of the highlights of the year if things go south. I’m certainly hoping this won’t be my final preview. The school is also holding a viewing party for all (potentially) three games this weekend at Buffalo Wild Wings. Puck Drops at 8:05pm EDT for each game. 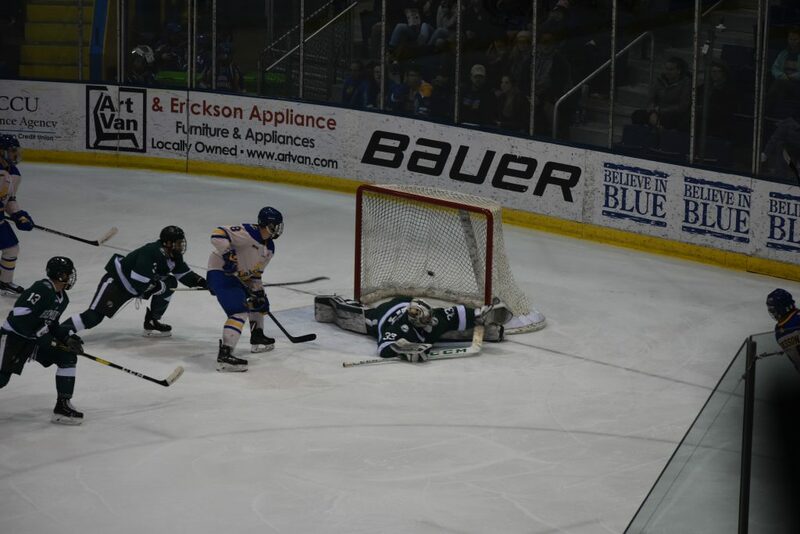 Hampus Eriksson (extreme right) puts the eventual game winner over Bemidji State goaltender Zach Driscoll. Lake State is moving on. 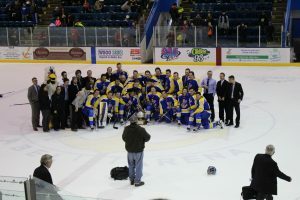 By picking up a 3-1 win, Lake Superior State won its first playoff series since their 2012 first round matchup against the University of Alaska. That series was also at home and ended in a sweep. Much like their game from the previous night, Lake Superior State (23-11-2) and Bemidji State (15-17-6) started out playing a wide open end to end game. Unlike Friday’s game, however, the Beavers had a much easier time generating shots on net, as they built up a strong shot advantage in the early going. Lake Superior fought back as the period wore on, closing the gap. 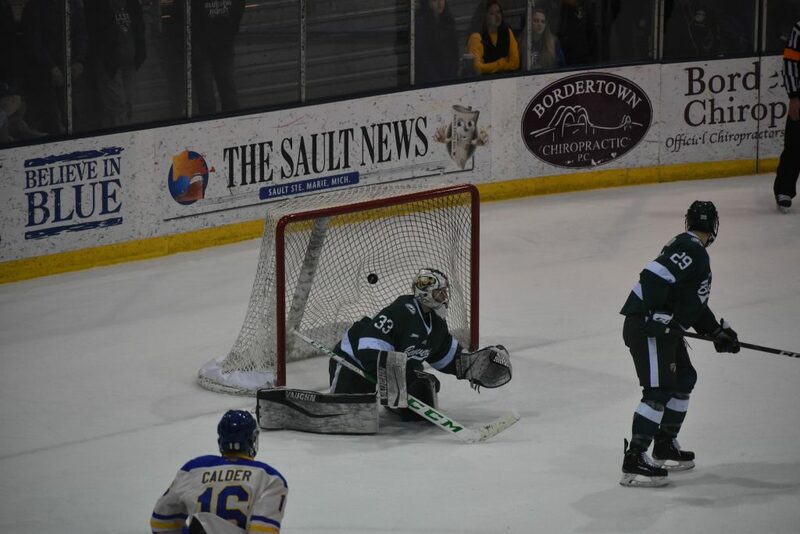 Lake Superior drew first blood when Max Humitz gave the Lakers a 1-0 lead that was initially waved off on the ice, despite the puck being in the net. A short review validated the tally, giving the forward from Livonia, Michigan, his 16th goal of the season. Fighting for their playoff lives, the Beavers struck back a short time later. A heavy shot by Justin Baudry eluded Laker goalie Nick Kossoff, tying the game at one goal apiece before the conclusion of the second period. After having been outshot 11-9 in the opening frame, Lake Superior outshot the Beavers 17-12 in the middle stanza. Early in the third period, Lake Superior got its first power play opportunity when Ethan Somoza went off for hooking. On the ensuing power play, Hampus Eriksson picked up a pass from the opposite faceoff circle and buried the puck behind Driscoll, restoring the Laker lead with his third goal of the year. Following the goal, the Beavers upped the pressure, desperately trying to net the tying goal. A pair of minor penalties hindered their efforts, with one coming immediately after the Eriksson goal and the other with less than 5 minutes to play. In earning the win, Kossoff stopped 38 of 39 shots. Driscoll, meanwhile, made 29 saves on 31 shots faced. Interestingly, no penalties were called in the first two periods. Like Friday, there were few trips to the sin bin in general. By picking up two assists on the night, forward Diego Cuglietta is now sitting at 99 career points. With one more goal or assist, he will become the first Laker to reach the century mark since Dominic Monardo did so in 2013. Like Monardo, if he is to do it, it must happen on the road. With all of the upper seeds winning their respective playoff series, the Lakers will venture to Mankato next weekend to take on regular season champion Minnesota State. The Mavericks (29-7-2) dispatched Alabama Huntsville in their quarterfinal series. In their first home playoff game since joining the Western Collegiate Hockey Association (WCHA), the Lake Superior State Lakers earned a hard fought 4-2 win on the ice at the Taffy Abel Arena. A successful power play was the difference maker for the Lakers (22-11-2), as they went 2 for 3 with the man advantage, and notched one more just after the expiration of another power play. Both teams came out of the opening puck drop with a great deal of energy, as end to end rushes dictated the play through the early part of the first. Bemidji State (15-16-6) drew first blood when freshman Nick Cardelli ripped the puck past Laker goaltender Nick Kossoff midway thru the first period. Lake Superior evened things up early in the second when Jay Dickman went off for throwing the stick. The Lakers sustained pressure on Driscoll, but could not capitalize on the power play itself. Just eight seconds after the Beavers returned to full strength, Diego Cuglietta collected his own rebound and slipped it past the outstretched leg of Driscoll for his 24th goal of the season. Cuglietta has the most goals in a season among all Lakers players since 1995-96. Late in the middle frame, the Beavers were assessed another penalty, this time to Dillon Eichstadt for interference. Much like on their first attempt, the Lakers were largly stymied by Driscoll . 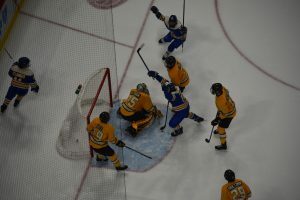 Unlike their first power play, Lake Superior managed to capitalize, as a long shot by Lukas Kälble eluded the Beaver goalie, giving the home team its first lead of the night. In the third period, on their next power play, Ashton Calder found Anthony Nellis all alone on the left side of Driscoll, who potted the puck before the netminder could get into position, giving the Lakers a 3-1 lead. Shortly after the Nellis goal, the Lakers found themselves in a precarious position. A delayed penalty to Steven Ruggiero enabled the Beavers to pull Driscoll for an extra attacker. Brad Johnson rang a shot off of a goalpost that hit just right, going behind Kossoff and making the score a one goal affair. Making matters worse for Lake Superior, the penalty still had to be served. Luckily for the Lakers, their penalty kill proved up to the task and kept the Beavers at bay. With time running out, Bemidji State reverted to a more physical game, hoping to earn the equalizer. The Beavers were unsuccessful in this endeavour, and Max Humitz scored an empty netter from the blue line with 15 seconds to play, locking up a 4-2 win for Lake Superior. 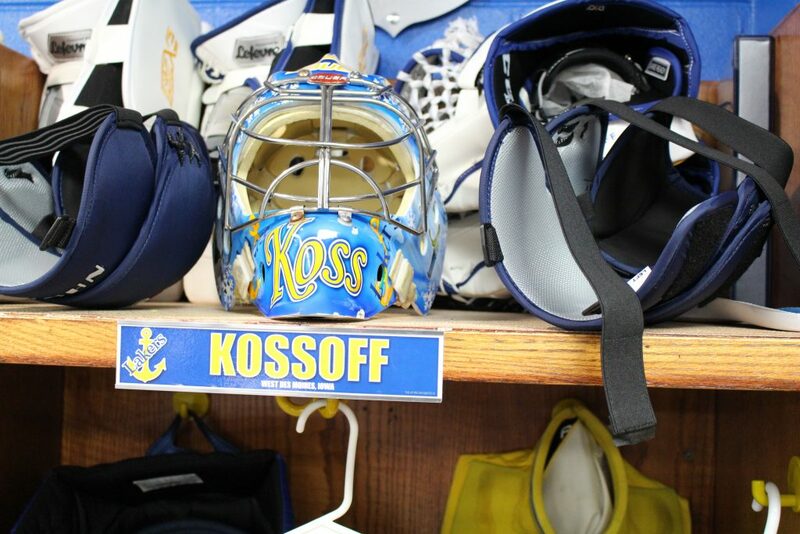 In net, Kossoff made 29 of 31 saves. Across the ice, Dirscoll stopped 17 of 20 shots. 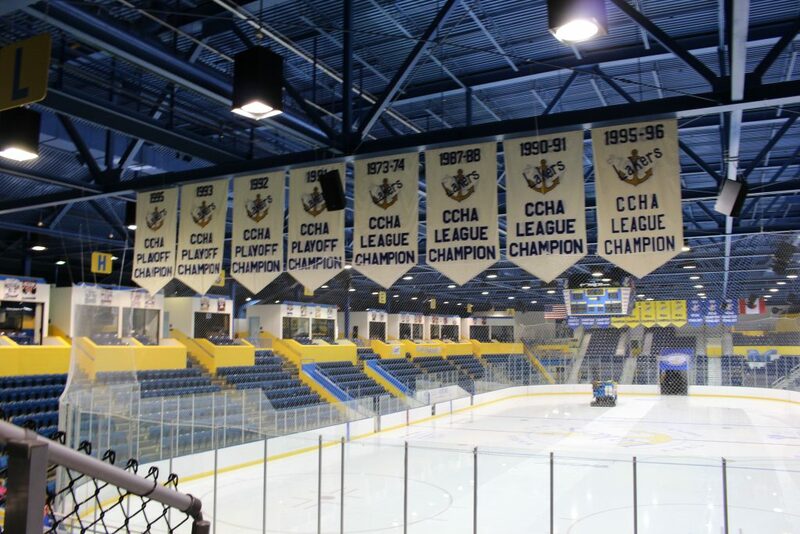 The last time the Lakers hosted a playoff series was in 2012-13, which was the final season of the Central Collegiate Hockey Association (CCHA). The Lakers fell in three games to Bowling Green State that season. The two teams will play game two of the best-of-three quarterfinal series on Saturday. Game time is 7:07 p.m. EST. This is the second part of the annual Cappo Cup series between Northern Michigan and LSSU. Going into this series, hosted in Marquette, the series is tied 1-1, with a +1-goal differential going to LSSU. 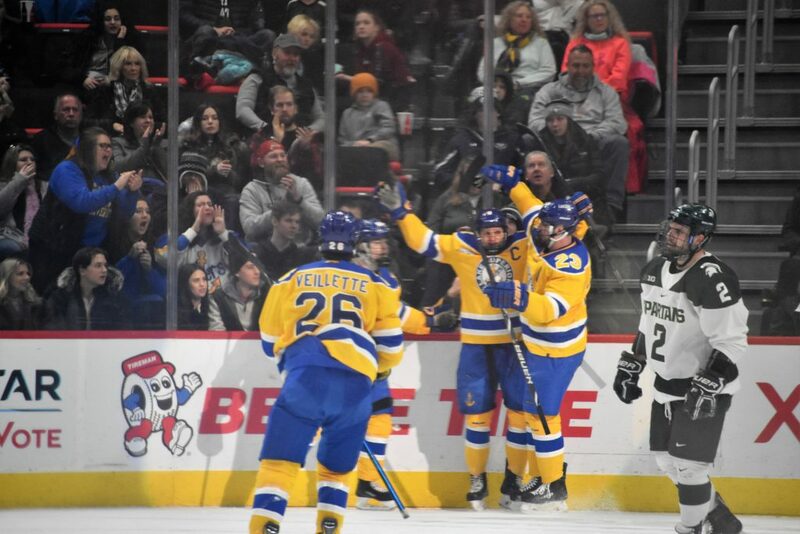 This year’s Wildcat team has gotten a lot of help from their blue line in scoring, as their top scorer is junior defenseman Philip Beaulieu, who in 30 games has amassed 5 goals and 23 assists for 28 points. Close behind him is senior Troy Loggins (15g 12a for 27tp) then by Adam Rockwood, another senior forward with 5 goals, 16 assists and 21 points. The net has been owned by the excellent senior Finnish netminder Atte Tolvanen, who has played in every game this season, earning their 15-14-2 record, with a 2.31 GAA and .915 Save%. Freshman backup Nolan Kent has appeared in 2 games, but looks like mostly in relief as no wins or losses are attributed to him. After last year’s run, this year has certainly been a disappointment to Wildcat fans, and there are certainly some questions concerning the future progress of the team, especially in net. Tolvanen has played very well in spite of some of the play in front of him over the years, even managing to score a goal this season. With the workhorse leaving after this season, I hope for the sake of their fans they have another workhorse or two coming in next season. What can be said about this team that hasn’t already been said across the College Hockey world this last week? I’ll for sure be doing a writeup at some point as a retrospective on the season, but needless to say it’s been one for the ages. I can’t imagine what this year must be like for longtime fans, who’ve seen some of the worst seasons the Lakers have had. This year, though, has been a dream. Another dream may be realized over the next few weeks: another 100 point scorer. That player is Diego Cuglietta, who has a total of 93 points heading into this weekend. (34 senior, 23 junior, 25 sophomore,11 freshman). After him looks to be Max Humitz, who has 73 points, of course he should be hitting it next season. Tied with Humitz, for this season’s point total, is Anthony Nellis with 30 points. Kossoff again owns the net, though Mitens did post a huge win Friday night against rival Michigan Tech. It’s anyone’s guess as to what will happen in net over the weekend, and I’ve been wrong almost every time I’ve guessed this season, so use your imagination. Puck drops both Friday and Saturday at 7:07 at the Berry Events Center in Marquette, MI. In the Soo, the game will be broadcast on 99.5 YESFm, and can be heard online at yesfm.net and on the TuneIn App. FloHockey.tv will also have the video for the game.